Cheers to a Gorgeous Life! 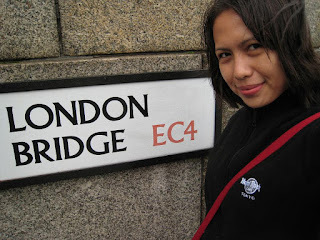 : London baby.. yeah! I'm here! I'm here in the land of Prince Harry (who's under investigation by the way because he apparently shot 2 protected birds... tsk tsk... naughty Harry). I'm here in the land where people speak in a cute accent that makes me bat my eyelashes and drop into a curtsy. I'm here in the land of cute guys that seem to literally pop out of a fashion magazine (too bad because most of them are obviously a decade - shocks decade - younger than me and it doesn't matter anyway because still Harley is way more cute). Oh yes, I'm here in UK, specifically London baby, yeah! Bloody great. Bloody fantastic. Bloody awesome! Last week, 24Oct, Steng and Jaspher dropped me off at NAIA1. I was 3 hours early for my flight which was a good thing because when the KLM people weighed my luggages they were 6kilos in excess! If I had no more time then, I would have paid the 19k fee (they charge 30 Euros per kilo). Of course I refused to pay such amount so in the middle of that airport I opened my bags and removed the heavy stuffs that I could do without - wala akong pakialam na nakatiwangwang na mga undies ko for all to see. Proud naman kasi ako dahil filtered na yun, meaning di ko dinala yung maluwang na ang garter or yung may butas, nyehehehe :p After countless times of weighing and opening my baggage again to see what else I could remove (I had those stuffs left at the airport for Mau to pick up), I finally managed to lower the baggages' weight to the maximum allowable weight. Even with that much hassle, I was still all smiles when I traipsed towards the gate where I should wait for boarding. Because nothing, absolutely nothing could ruin that day for me. It was one heck of an adventure because not only I was travelling alone, nobody was assigned to meet me at the aiport. I must have had the exact feeling the country mouse felt when he went to visit his cousin who lived in the city. I just had to rely on the fact that no one's a dimwit enough to mug me because no one would expect a Filipino like me carrying a sizeable money in pounds. I decided to hail a cab and was relieved to notice that every cab waiting at the airport had a CCTV camera inside. But I was astounded when we reached my hotel. That was when the cabbie told me the fare was 50 pounds - bloody hell that's 4500 in our money! I made a mental note then that I should never ever convert pounds to peso while spending money here because I might end up miserable throughout my stay. 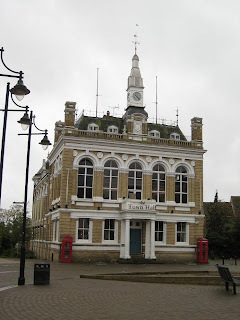 Town hall - isn't it cute? It's cold but still manageable. It's like walking with full blast aircon following you around. I hope I can survive the winter - I have low tolerance of the cold you see. I shiver easily. Work is also interesting. In our team there's only 6 of us - 3 Britons, 1 French, 1 Spaniard and I'm the only Asian. Britons are very soft spoken and I absolutely love their accent. They are also very polite and they do behave gentlemanly - like they'll always open the door for you. Their work ethics are also very commendable. They work nonstop, almost not even pausing for lunch, like they usually take their lunch at their desk eating while they continue working. But no matter how busy they'll usually rush home after completing the 7.5 hours work per day. Because they say there's life after work - they're anxious to spend time with their families. Britons are also health concious. I notice that most of them have baon na fruits for elevenses (snack in the morning). I roamed around Central London on my own last weekend. I took the train and then bought a one day bus pass. 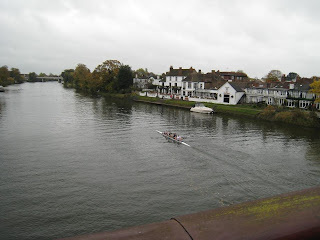 I went first to the London Bridge - a fitting place for my first Georgia-was-here UK list. 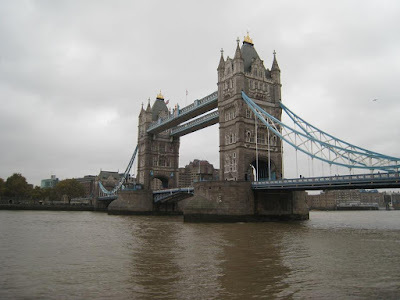 I then followed a throng of tourists to the Tower Bridge and Tower of London. Next on my agenda was St. Paul's Cathedral but unfortunately I got on the wrong bus and napadpad ako dun sa slum area ng London. It's like a settlement of immigrants because there were many Pakistani & Indians nakatambay sa streets - the part of London na madumi. Good thing I found my way out from there in no time. At St. Paul's I attended the Evensong - choral service in which the St. Paul's Cathedral Chorus sang the prayers in English and Latin. 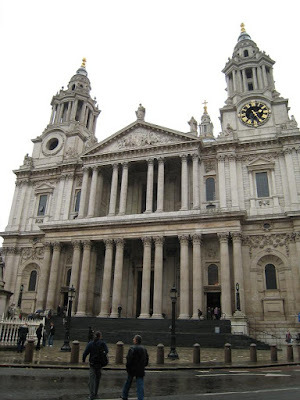 I almost cried because it seemed like a dream that I was actually at St. Paul's Cathedral attending a church service. The cathedral is simply divine. The paintings and carvings on the ceilings seem gilded with gold. Unfortunately it's forbidden to take pictures inside. I just resolved to light a candle just thanking Him of the wonderful blessing of being here. ate georrrrrrrrrrgggggggeee!!! nasa UK ka na pala! i'm so proud and happy for you!